​​​​​ ROBSTOWN, NUECES COUNTY – The Outlets at Corpus Christi Bay will have a new neighbor. 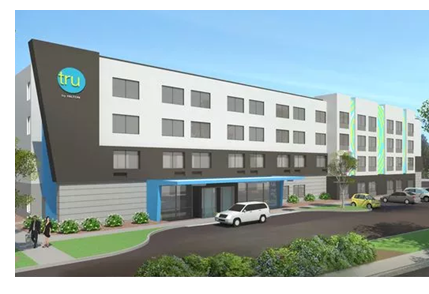 Tru by Hilton will be developed under the partnership of Robstown Hospitality LLC and the outlets. The project is scheduled to break ground in summer 2018. Plans include 80 guest rooms, complimentary breakfast buffet, free Wi-Fi and a fitness center. Developers hope the hotel will serve shoppers who make the drive to Robstown especially for the outlets, and also visitors to the Richard M. Borchard Regional Fairgrounds and corporate and leisure travelers to the Coastal Bend. Outlets at Corpus Christi Bay​ ​opened last March with H&M, Nike, Brooks Brothers, Express and Guess as its flagship clothing stores.